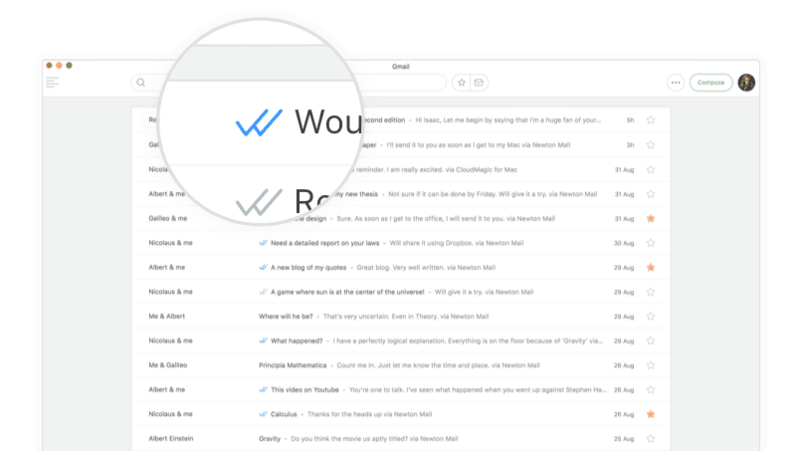 I’ve been searching for a better email app since 2016 and tried many. I’ve been using Gmail’s native app in mobile and web version on PC since I remember. Later when I get more inclined to productivity, I moved to Inbox by Google immediately after its release. So, for the past few years, there’s nothing to replace it. I used ‘Inbox by Google’ both on my phone and PC. It was sufficient, yet I parallelly in search of another email client/app that could aid my productivity with its features and power. Fortunately, I’ve heard about this email app called Newton. At first, I am sceptical about it, about their claim “Email. Supercharged. Email app with space-age features”. One reason for it was, I had tested its former version called as “CloudMagic”, found it as another app among the thousands. (Newton is reformed and entirely different from CloudMagic’s first app for email client). Based on Carl Pullein‘s (a productivity and time management couch) recommendation, I decided to give Newton a go. Newton app offers 14-day trial period, which half-heartedly took to test the potential of it. First two days, it went in vain as it all took for setup, migration from my current email system. The initial set-up will be a snap, but the thing is, it is little difficult to incorporate my existing systems, the way I handle emails with this new app. At first, I tried this only on PC (Windows) and then after few days, I did it on my Android. Slowly I get used to the new environment of email systems. I pulled in all my email accounts one by one on the third day, now I run 5 different email accounts inside Newton app. What made me to fell for Newton app? First, the elegance of its interface. It is so damn minimalistic, taking everything away from you except the critical things of an email. When I say minimalistic, it doesn’t mean less in terms of its power and efficiency. I believe in minimalism and truly the crux of productivity lies there. But I never felt this deadly combo of power and minimalistic interface in an app (obviously next to Todoist and after Evernote). Composing a mail-in Newton is like a blessing, you can feel the difference. The interface, the level of minimal data shown to my eyes helped me a lot to focus on what I am doing. There’s a perfect balance between ‘Less’ and ‘More’. Less, minimalistic approach and More, powerful features. Read Receipt, a WhatsApp like double tick right before your email subject to denote whether your mail is read or not. That worked charmingly out of the box. I used ‘boomerang’ an app for Gmail for this feature, but that didn’t work well to my expectation. Send Later, it is the snappy feature, that I used with ‘boomerang‘ in Gmail, this too comes out of the box with a little more advanced options I love. Snooze, an option I enjoyed with ‘Inbox by Google’ which is also an available feature in new Gmail 2.0. Sender Profile, a feature that fetches relevant and most important data about the sender from the internet. Newton claims, “On an average, we spend 12 minutes researching on people who email us for the first time.”. With this feature, the sender profile is just a click away. Connected apps is a feature that lets you connect Newton to your favourite apps, in my case, it is Todoist and Evernote (including ‘Pocket’, an app to collect all the web pages in one place so that it can be read later). 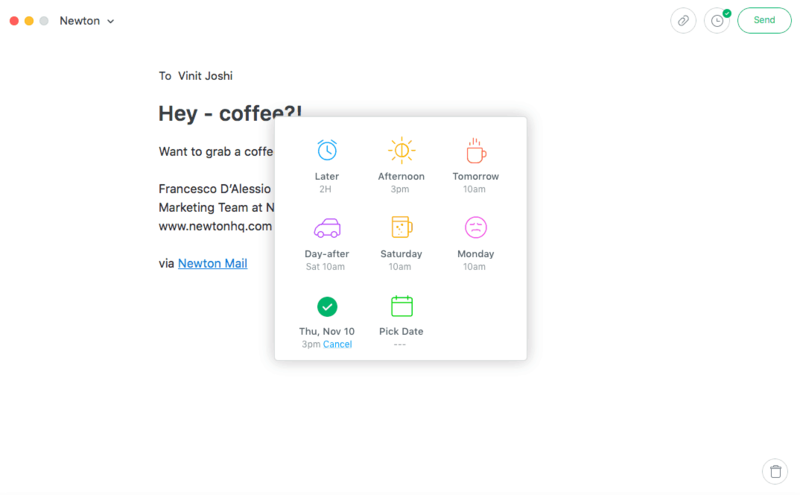 Low Priority folder or Tidy Inbox (that’s what the Newton people calls it) which automatically collects email types like the newsletter, social media site’s notification and so on. ‘One-click unsubscribe’ is also a feature I enjoy in Newton as like in Gmail. Note: These superchargers are only available for premium users. The app is free forever to use without these features. For most basic users, it is more than enough. But if the emails are more important to you, occupies your major part of communication (both professional and personal), then it is worth the money $49 per year. Here, I also have to confess that, I use Gmail’s web version to access my emails, where I don’t take my laptop. PC app doesn’t support attachment of files from Google Drive like Android app. Apart from these small things, Newton has become my daily runner for all of my email accounts. And I recommend you all give it a try.